Craig Drake has created a masterpiece of geek art from the original Joe Johnston white Proto Fett concept which he’s currently exhibiting at the Hero Complex Gallery, including these blue variants. He couldn’t miss out on doing the full Boba Fett as well, but what I’m really looking forward to is the surprises he’s going to launch on us at Star Wars Celebration at Anaheim, and if it’s going to be anything like what he’s shown already, were in for a geekologie treat. Star Wars Celebration is just a few short months and the official Star Wars website has just revealed some key art from the event. The posters are a pure Mondo art form unto themselves, and for an artist to capture the essence of Star Wars on a poster — the feel and look of the films, the drama of the stories isn’t easy…but Star Wars Celebration is in safe hands with my favourite Mondo artist, the incredibly gifted Craig Drake, who’s produced some stunning new artwork for April’s mega-event. These standalone Mondo portraits of Boba Fett and a ‘Original Trilogy’ Stormtrooper he posted on his Facebook page will make a timeless poster on any Star Wars fans wall. 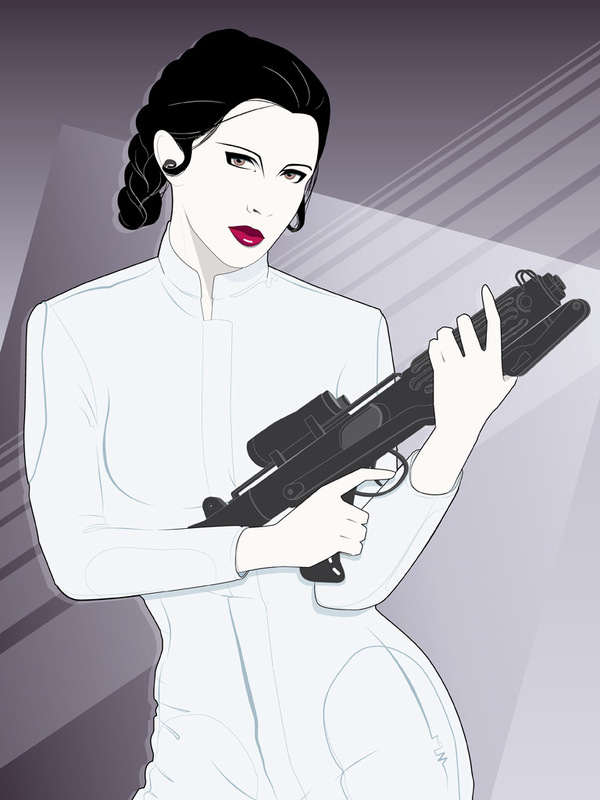 He even posted some new Leia artwork on his Tumblr site, a standalone variant of Leia from the Star Wars Celebration poster, and ‘Empire Leia’ in her Hoth outfit, which is quite reminiscent of his first Leia artwork. What I found out most recently about him, was his love of fellow Star Wars Poster artist Drew Struzan and the legendary concept artist Ralph McQuarrie, and also having been a senior designer at Star Wars.com, you know he has an inherent love of the SW Universe, which really shows in his work. Drake loves and knows Star Wars, having worked at Lucasfilm for seven years as the senior designer of StarWars.com, and he has that rare ability to convey what we love about a galaxy far, far away in an immediate, almost subconscious way. In his poster, there are classic Star Wars elements: the overwhelming power of Darth Vader, dark and light colors in a sort of harmonious conflict, and a sense of Star Wars-branded danger and excitement. The style, however, is all Drake’s: the lines are sharp, the details simple, the colors bold. Ultimately, the image successfully adapts his style into the language of a movie poster. So how did he do it? “I essentially took the basic line art that I usually do, that’s very recognizable, and painted over it,” Drake tells StarWars.com. “Before I even did that, I took a look at the [legendary movie- and Star Wars-poster artist] Drew Struzan’s of the world and how those color palettes feel. So, the basis for what I usually do is there, it’s just underneath a lot of color enhancement and free-hand painting, just to dial it up a bit, and I think it added a nice touch that made it feel more filmic.” It’s a method that allows Drake to employ his own style while still making something that’s familiar. Yet, upon closer inspection, it’s not THAT familiar — Han, the stormtrooper, Leia, and Vader all look and feel the part, but their poses can’t quite be placed in a specific movie scene. The expressions match the characters, but they’re kind of new, too. That unfamiliar familiarity, it turns out, is intentional. “I like to go into the films and take screen caps for reference, versus the style-guide art,” Drake says. “Style guides are asset kits [given to artists and third parties]. It’s a wealth of images. You see those poses used quite a bit in posters and packaging, so I wanted to dig a little deeper into the films themselves.” His process involves scanning scenes with an eye toward the unusual, or something rarely seen. When it came to Vader, Drake had a clear goal. “I was trying to get this very perfect side view, a really great profile. You don’t see Vader from the side very often, and I think it’s a neat shape. I grabbed a shot from Episode V that worked really, really well.” The result is striking. Vader is cast as a grand, ominous figure, almost engulfing all others; the side view seems new, and the arched angle, with Vader looking upward, hints at the tragedy and internal struggle of the fallen Jedi. When Drake can’t find a shot that matches what he sees in his head, he gets even more creative, mashing up different character appearances to create a new image. “Specifically, the one that [technique] worked for was the Leia profile shot,” he says. “I got that reference from the medal ceremony at the end of Episode IV. She had a different hairdo, so I got her face from that, and then did her hair from memory.” Leia wasn’t always a sure thing for the final poster, however. Originally, Drake explored different character options and color choices — with a much greater focus on the dark side (for lack of better term) of Star Wars — revealed below for the first time anywhere. “I initially was given quite a bit of freedom to tackle a theme,” Drake says of the early process, “and that’s how I came up with the first version, featuring Boba [Fett], Vader, and the stormtrooper.” His inspiration came not from a specific love of the bad guys, though. It was borne more out of the spirit of Star Wars Celebration. “I really thought of it from the fan perspective,” he says. “You know, at those events, people dress up. Especially the 501st Legion, with everyone crafting their costumes. It seems to be the stormtroopers, Boba Fetts, and Vaders are the heavy focus in terms of costumes. Those are just iconic, wonderful shapes to actually illustrate. And I think through that process, we quickly decided, these are neat looking, but we actually wanted to include human faces and build it out like a traditional movie poster with a variety of characters.” This led to the second attempt, also seen above, which saw a new layout and added a certain sharp-shooting princess; finally, the third time was the charm, as the Han-focused illustration struck the right balance of heroes, villains, and energy. By looking at earlier versions of the poster in comparison with the final art, however, certain elements emerge that harken back to core Star Wars designs. Drake’s work doesn’t end with the badges, however. He’s also created a Star Wars Rebels variant poster — which was revealed exclusively on StarWars.com. ..The poster was like fresh new territory. I’m looking forward to exploring even more. The stormtrooper remains, creating a thematic connection between this and the original; the animated heroes and villains of Star Wars Rebels fit seamlessly with Drake’s take on the movie characters; and Star Wars‘ themes of darkness and light, and its sense of wonder, are present and strong. With Star Wars Rebels still new, Drake had less imagery to pull from — a challenge he enjoyed. “It was particularly fun for that reason,” he says. “The poster was like fresh new territory. I’m looking forward to exploring even more.” With more badges and art to go, he’ll have his chance. Do you remember Topps trading cards? The ones that came with a stick of really hard dry chewing gum? I certainly do, and still have my treasured “1st” series of collectible cards featuring scenes and characters from around the galaxy for the original 1977 Star Wars movie. The top of my deck is No:1 Luke Skywalker, although it’s little tatty, but I prefer to consider it ‘well-loved’ after over 30 years ago of “Collect ‘Em, Trade ‘Em” which was the catchphrase of the Topps trading card company in those early days. There was five rounds of the Topps cards for that movie, each one designated by a different colour. Now 34 years later, they return “surprisingly” via J.J. Abrams who is well-known for his “mystery box” approach to movies; he lets as little information out as possible before the film’s release, but he has benevolently buckled to Disney’s open approach to marketing and cracked open this Star Wars mystery box and put some names to the faces we saw in the first teaser for The Force Awakens. And in the charming retro style nod to the original “first fans” with a digital set of trading cards, cementing their long-running tradition of Star Wars Merchandising tie-in with Topps Trading Card Company. At last we no longer have to call that adorable, rolling robot “football ball droid.” that character now has its own R2 D2 style alphanumeric moniker: BB-8. Next were introduced to Finn, but we don’t know the last name of John Boyega’s character, so that could also be an important omission. But the extra three words of description—”on the run”—explains a little bit why he is seen jumping into frame and gasping in the opening moments of that trailer. Although he’s in a Stormtrooper uniform, we don’t know for sure if he is an actual trooper or if, like Han and Luke in A New Hope, he’s just using it as a disguise. The most interesting reveal is Daisy Ridley’s character, who we now know is called Rey. For some time, it was rumoured that she was going to be called Kira, the so-called daughter of Han & Leia from the Expanded Universe…Well, this just goes to prove we can’t believe everything we read on the web. Poe Dameron! now there’s a name weighted with significance. Some fans have already gleaned an intense, not necessarily welcoming vibe off of Oscar Isaac’s X-Wing pilot, and a first name taken from a writer who chronicled the sinister side of human nature would suggest that this is a character who is on the edge of the light/dark divide. His name is almost identical to Cameron Poe, the character Nicolas Cage played in Con Air. Coincidence?…Oh yeah, but in reverse…light to dark? The original Ralph McQuarrie designed X-Wings skidding along the surface of a lake rather than screaming through the void of space is joy to see. And that shadowy figure who’s clearly the Sith villain, mentioned in the trailer as the dark side of the awakening that has taken place. As he stumbles through the snow with his modified cross guard or claymore lightsaber is now called Kylo Ren which I’m guessing is Adam Driver. It’s finally here…”YEAHHH!” he screams, my first look at the new Star Wars. The teaser trailer runs 88-seconds long and here’s all you need to know: it looks frackin awesomesause. The trailer gives us a first glimpse at a lot of the new and returning stars, but it also shows just how great a job director J.J. Abrams’ appears to have done in putting back together the Star Wars universe. A great score from John Williams elevates that even further. This isn’t much for now, but it ought to get fans like me’ hopes way up…and it does. What a dark sinister opening voiceover for the new Teaser Trailer for Star Wars Episode VII The Force Awakens, as we see our first real scene lingering on the desert, which I’m presuming is Tatooine. But who was it doing the voice over…Benedict Cumberbatch or Max von Sydow? for me it sounded like Benedict…which is so bodacious on a geeky level. Then we see that chunky speederbike, driven by The Force Awakens new star Daisy Ridley, which looks closer in appearance to a flipped landspeeder, but it has quite an industrial Tug/Loader look to it. And what about Ridley, who looks to be playing a Skywalker-esque figure called Kira, trapped on a desert planet and yearning for excitement and adventure, which it looks like she’s just found with the way she looks and her hastened departure towards the Ralph McQuarrie designed desert town. How do stormtroopers still exist? The end of Return of the Jedi a montage of the ‘New’ celebratory shots signaling the apparent end of the Empire. After the emperor’s death at the hands of angry daddy Darth Vader, are stormtroopers still Imperial stormtroopers? Have they been co-opted into a new government’s military structure? If so, why did they not change their super-evil hats? You’d think those would be the first things to go with a regime change. Perhaps some remnant of the Empire clings on, and that the Rebel Alliance’s victory in the Endor system was not as absolute as they would have had us believe… Yet again, so many questions. Oscar Isaac at the helm of an X-Wing, callsign unknown, but I bet its a Red Squadron. My next question is compounded by the Rebel logo still plastered on the X-Wing pilots’ helmets. This shows that the Rebel Alliance is still a going concern some 30 years after the destruction of the second Death Star, with battles to fight that require the deployment of starfighters — starfighters, it should be noted, that are three decades old. Why is the organization that unseated the Empire flying around in aging tin cans? And why can’t its pilots afford new helmets? That’s presumably a Sith wielding a distinctive (and already much-mocked) lightsaber. The black robes and red saber color give the game away, but note also the length of the hilt. It’s long enough for the wielder to grip with two hands, giving them the powerful swinging style used by Darth Vader. As that new lightsaber ignites it’s big, sort of flickers in a flame sort of way, and it has a crossbar. The best explanation I’ve heard points out that the crossbar beams look unfocused and that maybe this guy is an old Sith “reawakened,” and that he has an early model lightsaber, which points to whether is could be Max von Sydow….More flaming questions!! Remember the dish that was knocked off the Millennium Falcon in Return of the Jedi? It’s still missing here, replaced by a rectangular box, which some leaked ‘GIF’ footage showed, although it wasn’t the scene we thought it would be in the trailer, which makes me think it was fake. I’ve got to say, the Millennium Falcon really does bust some stomach-churning moves to escape from TIE fighters over the surface of a desert planet that’s probably Tatooine. While this is only a short glimpse at The Force Awakens, this is the first look that we’ve all gotten, Disney has been incredibly secretive about the production of Episode VII, but it’s also for a much simpler reason: the movie still isn’t done. Filming wrapped on Thursday the, 6th of November 2014, but the movie is still a long way from completion. That’ll be especially true for its special-effects shots, which are likely far from complete at this point, and hopefully been done at the new Industrial Light & Magic Studio in London . Art of Star WarsBall Droidcrossbar beamsDaisy RidleyDaisy Ridley LandspeederDaisy Ridley SpeederbikeFootball DroidJohn BoyegaJohn Boyega Stormtrooperlaser claymoreLightsabre crossbar beamsMax von SydowNew LightsabreOscar Isaac X-WingStar WarsStar Wars Episode VII The Force AwakensStar Wars Episode VII The Force Awakens Trailer AnalysisStar Wars FootballStar Wars Teaser TrailerThe FalconThere's been an awakening. Have you felt it? It seems even after his death; Ralph McQuarrie’s visionary concept art from the original Star Wars saga is influencing a whole new generation of Star Wars film makers, especially the latest movie J.J.Abrams is working on (Star Wars VII The Force Awakens) with unused X-Wing designs and architectural visions from the LucasFilm Archives. The early X-Wing design had a split single on each wing, until it was changed to the two-cylinder engine option on each side, but recent leaked onset imagery and J.J.Abrams special video message from the set of Star Wars: Episode VII, he announced the creation of Star Wars: Force for Change, a brand new Star Wars initiative from Disney and Lucasfilm, in collaboration with Bad Robot, dedicated to finding creative solutions to some of the world’s biggest problems. The first Star Wars: Force for Change campaign got fans to pledge funds to campaign and awareness for UNICEF’s Innovation Labs and its innovative projects benefitting children in need. By doing this one lucky Star Wars fan from Colorado who contributed got to visit the set. What the video does confirm is the reusing of Ralph’s single wing engine design. The other exciting resurrection of his work is the Silver Lightsabre wielding StormTrooper, which again has been seen in ‘more’ leaked on-set images, I wonder if the much talked about DarkTropper will make an appearance. It also seems his early architectural concept art has made it into the film, as you can see from his concept and on-set photos show. I wonder what other unused Ralph McQuarrie concept art will be used, the forest Jedi temple? the emperors cave temple? I guess we’ll have to wait a year to find out, but until then we can gracious in the fact the old masters work lives on.